One thing I hate when I’m browsing the web is being distracted. I hate those blinking, moving ads, auto-play videos, and all the other cruft that websites use to try to get you to click, click, click somewhere, rather than read the article that attracted you in the first place. One of the worst offenders on the web annoyance hitlist is Flash animations. They can take the form of videos on YouTube and other sites (though YouTube recently made the default video format HTML5), or those moving ads you often see on websites. There’s nothing more distracting when you’re trying to read an article than something that moves, and that’s the whole point of these ads. They need to attract your attention. The free ClickToPlugin extension blocks every item on a website that uses a plug-in, swapping them out placeholders. The ClickToPlugin plug-in replaces any items on a website that use plug-ins with placeholders. When you see one of these placeholders, it shows you which plug-in is used. You can click it to load the item, or just ignore it. There’s also a Flash-specific version of the extension, ClickToFlash, if you only want to block Flash animations, but the full ClickToPlugin is more useful because it blocks all multimedia animations. Both plug-ins have a number of settings allowing you to whitelist sites where you want plug-ins to load, and ClickToPlugin lets you choose specific plug-ins that will always load. This can be useful if your work involves the use of certain plug-ins. While Flash is a scourge, ads in general can be a major annoyance. The donation-ware AdBlock scours your websites, making them much more readable. It blocks graphical ads, text ads, and even ads in YouTube videos. But it also lets you whitelist sites whose ads you do want to see, to support them (as you’ll probably want to do for macworld.com), or because the ads may be useful, which is often the case for smaller websites that don’t use ad networks such as Google. 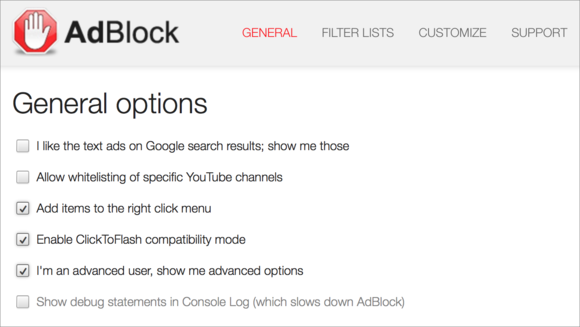 AdBlock lets you customize your ad-blocking settings and whitelist sites where you do want to see ads. Facebook is one of the biggest culprits in terms of cruft. When you look at a Facebook page, only a fraction of what you see is content that interests you. The free F. B. Purity (which accepts donations) “alters your view of Facebook to show only relevant information to you.” It nukes spam, ads, sponsored stories, animated GIFs, game and app stories, trending topics, and much more. F. B. Purity has lots of settings, allowing you to not only turn on certain blockers, but also create a list of custom text filters. So, if you have friends who are constantly talking about a subject that doesn’t interest you, like politics, sports, or religion, you can easily filter their posts. F. B. 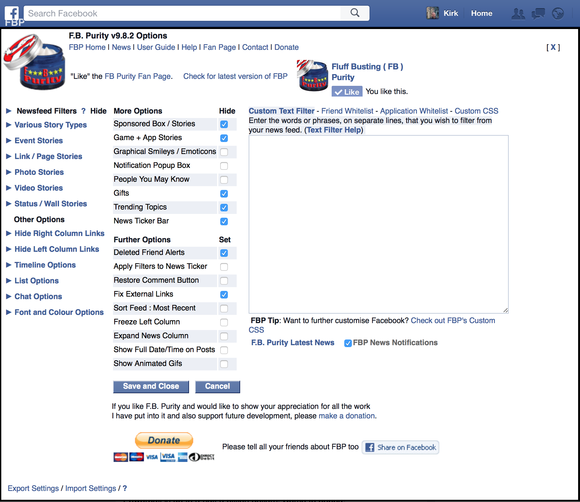 Purity lets you block unwanted content on Facebook. I hate searching the iTunes Store in iTunes. It’s slow, and the search interface is limited. Many times, when you go back to the previous page, it’s not in the same view as it was when you left it. Good news: You can search all of Apple’s stores using a search engine. Run a Google search like this: “artist album site:itunes.apple.com”. This lets your browser do the work, but when you click on search results, they’ll open in iTunes (not necessarily a good thing). Unless you use the NoMoreiTunes extension. This blocks the redirect code that bounces Apple’s store web pages to iTunes (or the Mac App Store or iBooks). 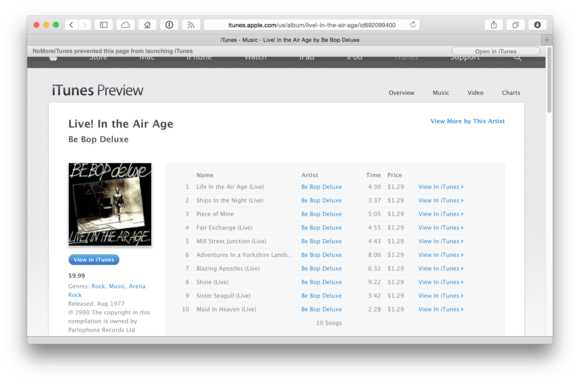 In its place, you’ll see a small button allowing you to open the page in iTunes if you want. 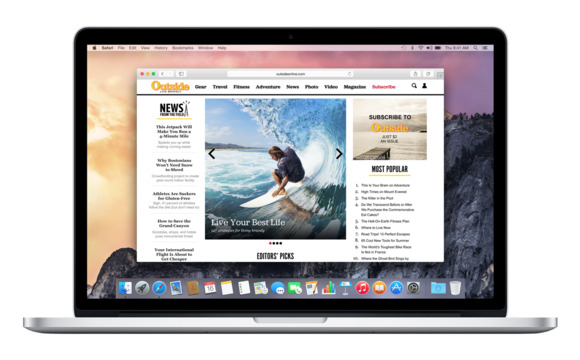 NoMoreiTunes lets you view the iTunes Store in your web browser. This makes it a lot easier to search Apple’s stores, then go to their apps when you choose. You probably know that you’re tracked on almost every website you visit. The free Incognito “prevents Google, Twitter and Facebook from following you on the web.” It doesn’t block ads, but it prevents these sites from tracking you. When you search for, say, cat shampoo on Google, you won’t see ads for cat shampoo on Facebook, or sponsored tweets from companies that make cat shampoo on Twitter. Incognito is more about protecting your privacy—it doesn’t prevent anything from being displayed, but it keeps your browsing a bit more private. 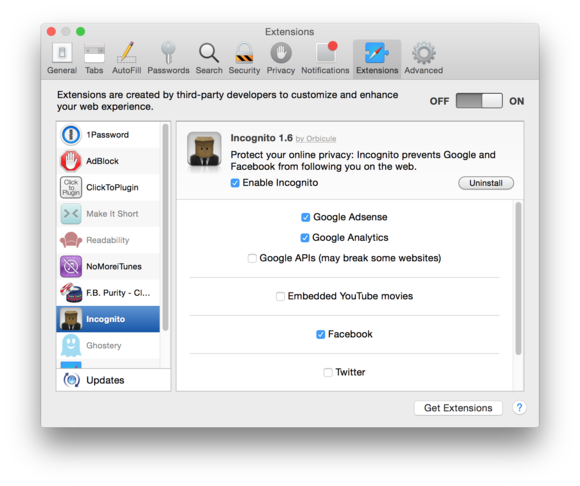 Incognito lets you surf the web without being tracked. With these five extensions, you’ll be able to surf more easily, save yourself some annoyance, and cut down time downloading overloaded web pages. Try them out and see how they change your browsing experience.